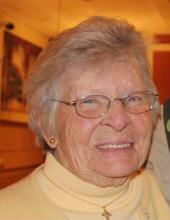 Anne E. "Nancy" Hotz (nee O'Hara), age 85, of Broomall, PA, formerly of Drexel Hill, PA, passed away on August 29, 2018. Born in Philadelphia, PA, she was the daughter of the late Patrick J. and Madeline O'Hara (nee Dunigan. Nancy had been employed as a telephone operator. She enjoyed spending time with her family in their home in Canada. Nancy had been a CCD teacher for many years at St. Bernadette Church, Drexel Hill, PA.
O'Hara, Patsy Love, Anthony O'Hara and Maureen Thomas. She is survived by her loving children Patrick J. Hotz (Janet), Betsy Wellman (Stephen) and Christopher L. Hotz (Denise). Madeline, Brendan, Samantha, Meghan, Mallory, Connor, Casey, Jamison, Danielle, Grace, Ali and Quinn and great-grandmother of Sawyer. Please share your memories of Anne.